A personal blog which documents a UK-based Sengoku Basara freak's ongoing quest to become even more immersed in anime, manga and games. Famitsu has now posted some of the content from the 4th July 2013 article on their website, including pictures and text from the interview with YamamotoD and KobaP. I summarised the key points from the interview before, but this is the first time we've been able to see some of those images up close since they were too small or obscured by text in the magazine. It's not due for release until September, but within a month of preorders being open the Dais Shop had already sold out of its allocation of ¥6,500 first press limited edition DVDs for the most recent Butai Sengoku Basara stage play. The ¥6,000 standard edition without the bonus photo book is still available. The Gamer website is reporting that mobile game Sengoku Basara Card Heroes Matsuri will be running a special campaign to tie in with this weekend's Butai Sengoku Basara Busho Matsuri 2013 event. The rules are simple; starting on 8th July 2013, players who fulfil certain in-game requirements will be rewarded with special sets of items. 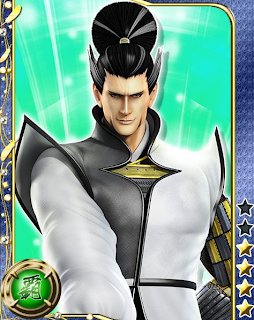 There's also a rare Matsunaga Hisahide card up for grabs since he was the star in the most recent stage play. Finally, this is a reminder that this Thursday (11th July 2013) will see the release of the issue of Dengeki Playstation magazine which will be featuring Sengoku Basara 4 as its cover story. They might not have any more information than Weekly Famitsu posted a few days ago but it's possible there'll be some new hints. We should be treated to updates on the official website and Famitsu.com on the same day. Afterwards the weekend will bring us the Busho Matsuri 2013 event where KobaP is presenting footage and information about the new game alongside the voice actors for Yoshiteru, Mitsunari and Hideyoshi. Hopes are high that this might be hinting that Hideyoshi will be announced for the game soon, so I'm keeping my fingers crossed! I'm really sorry that I had to switch on authentication for comments. The blog had started to receive dozens of spam comments each week. I hope that this new setting will help! Please link back if you use material elsewhere. I did not create the original articles I translate. Picture Window theme. Powered by Blogger.